You are right about the combustion chamber. When I was in the firebox, my attention was zoned in on the piece of 3/8" x 3" x 3" angle iron that was pinch-hitting for a vertical flanged corner near the front right corner of the firebox. Didn't pay too much attention to the combustion chamber after that. I never realized until seeing the photo in this thread how much she resembles another ALCO 1946 product, the Rutland L-1. Handsome steam. Are they roller bearing equipped? I wonder about the long smokebox also. FWH? No FWH. Checked some old notes and found that 3028 does have two Nathan non-lifting injectors, roller bearing drivers, hydrostatic lubricator, thermic syphons, Type E superheater, lateral motion device on lead drivers. Does the Great North Eastern Railroad Foundation even exist today? "In 1966, after 20 years of service on the N de M., Engine 3028 was acquired by the Great North Eastern Railroad Foundation and returned to its "birthplace" of Schenectady, New York. It was the intention of the Foundation to restore this locomotive to operation and display it as an example of the ultimate in design and construction of the great American Locomotive Company. 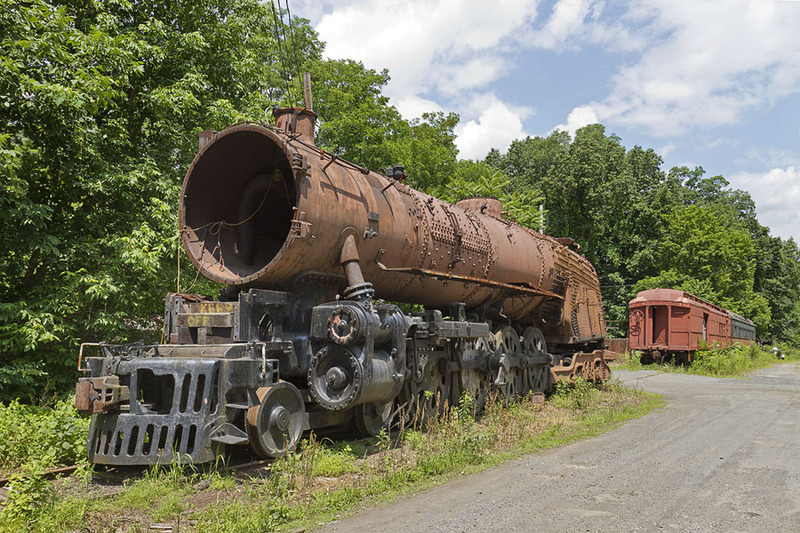 For almost 30 years, the Foundation carefully preserved and stored the engine, out of the weather, in the former Delaware & Hudson shops at Colonie, New York." I thought I originally heard that it was under a 10 year lease - wonder what, if anything, happened in 2004, 10 years after it arrived in New Hope? "In November 1994, the Great North Eastern Railroad Foundation entered into a long term rental agreement with the New Hope and Ivyland Rail Road, which allowed Locomotive 3028 to be moved from Colonie, New York to the New Hope and Ivyland Rail Road at New Hope, Pennsylvania. The agreement calls for Locomotive 3028 to be restored to full operating condition at the New Hope shop. It will then be placed into regular operating service on the New Hope and Ivyland Rail Road, joining "Old Number 40", a 1925 Baldwin, type 2-8-0 Steam Locomotive which has been providing most of the motive power on the Railroad. Together they will operate an extensive year-round schedule consisting of Regular Passenger Excursions, Elegant Dining Excursions and Special Charter Trains from the terminals at New Hope & Ivyland to and from the many rustic rural village stations stretching across Bucks county, Pennsylvania." I looked in Guidestar. The Great Northeastern Railroad Foundation was founded in 1965. There is a mailing address in Guilderland, NY. No recent tax returns are listed in Guidestar. This is from a recent Railpace article, back to you Ross! Also see http://ahts.org/. Please correct me if I'm wrong, but wasn't the Alco museum in a leased building and the status of the museum was "fledgling" at best? 3028 seems to be in a safe, stable secure environment at the NH&I. I sense a certain amount of risk in moving it to this new museum without a little more stable future. Niagara is spelled N I A G A R A in Mexico, too, NdeM folio drawings and Spanish language erecting cards have this spelling for class QR-1 locomotives. I won't mention the author's name, but the misconception regarding spelling was printed in a recent, and very excellent book covering the NdeM, even though a scan from one of the NdeM docs appears in the graphics and shows the correct spelling. In many different areas NdeM copied NYC practice intentionaly, including the word NIAGARA. Niagaras were built to have light axle loadings so they would be useful on the many secondary main lines in Mexico, this philosophy is similar to that used by China Rail in designing the QJ. Both classes were intended to operate in as wide a territory as possible, rather than to extract the maximum horsepower possible from their wheel arrangements. Both classes also have very modern boilers, capable of supplying more steam than would normaly be needed. While I don't have a crystal ball, I think this was intentional, and is part of the reason that these two classes lasted so long into the diesel age on NdeM and China Rail. Nobody has said anything yet, but Niagaras have front end throttles, maybe that is why the smokebox looks so long. The steam dome just has the dry pipe in it. Yes, they have mechanical lubricators, too. No they don't have feedwater heaters. You gotta remember it usually stays pretty warm in Mexico, the water in the tender, lines, and appliances isn't trying to freeze solid, one reason steam lasted longer in Latin Aerica. Niagaras also have combustion chambers and thermic syphons. Looks like a pretty modern firebox to me. Besides the 3028 in the USA, there are 16 Niagaras left in Mexico, most look pretty scuzzy and are missing lots of parts. Two happy exceptions to this are the 3034 in Puebla, and the 3038 in Mexico City, both complete, but in need of new tubes. Best of luck with the 3028, I sure hope when she is finished I can see her run again, and I know Mr. Rowland and friends will like her once they get to try her. Nobody has said anything yet, but Niagaras have front end throttles, maybe that is why the smokebox looks so long. The steam dome just has the dry pipe in it. I know for a fact that the 3028 has a dome throttle. While I am not a spokesperson for the place I do not see 3028 leaving in the near future. Not too much work has been done to her this year due to many other projects the railroad faced, however every other year I have been there, I started in 2006, work has indeed been done on her. Of course, Mr. Baldwin Feeder is correct, not only does NdeM 3028 have a dome throttle, but I checked both builder's and in service fotos of a dozen or so Niagaras (pronounced niA gA rA) and so do those ones, too. Oh well, I was RIGHT about all the other stuff I said. Well if you take a moment to read the article it says that " the steam locomotive is pretty much done". If the rest of the article is as factually incorrect as that quote then I leave it to you to judge its importance/substance. Just to point out a flaw, the article states that the alco group is working to aquire a 1946 alco steamer. I'd assume that the loco in question is the 3028. However, the article states that it's in the works, so it doesn't necessarily mean the 3028 is going to Schenectady. I'd put more money down on the NYC electric coming to Schenectady, and it's nowhere near as common as the niagaras from NdeM. I don't think there is a flaw in the article. In one place it mentions a 1946 steam locomotive; the last paragraph reproduced clearly states that the locomotive IS in New Hope. 3028 just happens to be the only 1946 steamer at New Hope, so we're talking one and the same. I would be surprised if NH&I has given up on 3028, though. Having a second steamer would give 40 a break, and 1533 looks like it needs far more work that 3028. Despite it's wheel arrangement, 3028 isn't really that large a locomotive, being built for service on secondary lines, a 'vest pocket' 4-8-4 if you will. And remember, 614 made a few break-in trips at New Hope, before running excursions on NJ Transit. I agree, you will see the electric from Colonie trucked to Schenectady LONG before 3028 leaves New Hope, if ever.